The NFL got "Back to Football" with a thrilling Kickoff Weekend. There were close games, standout performances and stars rising to the occasion. "It's a good start," says Atlanta quarterback MATT RYAN, who passed for 448 yards and three touchdowns in the Falcons' 37-34 overtime win over New Orleans. "We've still got a long way to go. You can't get too high or too low after Week 1." Everybody wants to get off to a good start as history has shown that teams that are victorious in their season openers are more than twice as likely to reach the playoffs than losers of an opening game. But that doesn't mean an 0-1 start is impossible to overcome as nearly 25 percent of teams that lost the opener went to the playoffs. Week 2 kicks off on Thursday night with an AFC North matchup between the Pittsburgh Steelers and the Baltimore Ravens (CBS/NFLN, 8:25 PM ET). The contest will kick off the inaugural partnership between CBS and NFL Network in broadcasting Thursday Night Football, which features the most marquee match-ups ever on Thursday night, including 14 divisional rivalries. The schedule will feature games in Weeks 2-8 and Week 16 (Saturday) broadcast on CBS that also will be simulcast on NFL Network. The Thursday night contests in Weeks 9-12 and Weeks 14-16 will be televised on NFL Network and simulcast on over-the-air stations in the teams' primary markets. There will be 14 games on Sunday, capped by the first regular-season game played at Levi's Stadium when the San Francisco 49ers host the Chicago Bears on Sunday Night Football (NBC, 8:30 PM ET). Week 2 concludes on Monday night when the Philadelphia Eagles travel to Indianapolis to face the Colts on Monday Night Football (ESPN, 8:30 PM ET). The Steelers opened the season with a 30-27 win over Cleveland on Kickoff Weekend. Quarterback BEN ROETHLISBERGER passed for 365 yards, including 278 in the first half as the Steelers built a 27-3 lead. After the Browns tied the game in the fourth quarter, Roethlisberger led Pittsburgh on a game-winning drive that culminated with SHAUN SUISHAM's 41-yard field goal as time expired. "We can't apologize for the way we win," says Roethlisberger. "We just have to win games." Also helping to win the game for the Steelers was second-year running back LE'VEON BELL, who rushed for 109 yards with a touchdown and had six catches for 88 yards. Bell's 197 scrimmage yards are a career-high. Baltimore will look to rebound from a 23-16 loss last week to Cincinnati. Despite passing for 345 yards, quarterback JOE FLACCO lost his first ever September start at home (11-1). Wide receiver STEVE SMITH, SR., who made his Ravens debut, had seven catches for 118 yards, including an 80-yard touchdown in the fourth quarter that briefly put Baltimore ahead. "We got ourselves in position to win," says Flacco, "but we didn't play well enough to win it." 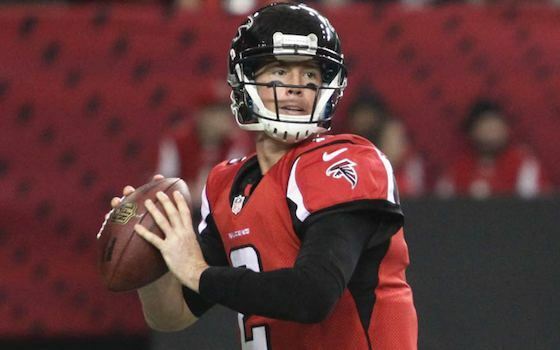 Atlanta quarterback MATT RYAN passed for a franchise-record 448 yards -- the second-most ever by a quarterback on Kickoff Weekend without throwing an interception -- and three touchdowns as he led the Falcons to a come-from-behind 37-34 overtime victory. Ryan recorded his 24th career game-winning drive in the fourth quarter or overtime, the most in the NFL since he entered the league in 2008. He also became the franchise's all-time leader in career touchdown passes with 156, passing STEVE BARTKOWSKI (154). "It's a good start for us and a good start in the division," says Ryan. "It's what we wanted to do. We'll enjoy it but we've got to get back to work. We're going against a very good defense in Cincinnati this week." The Bengals are also coming off a Week 1 division win as they defeated Baltimore 23-16. The defense stopped the Ravens deep in Cincinnati territory late in the game with consecutive sacks on Baltimore's final two offensive plays. Defensive end WALLACE GILBERRY (1.5 sacks) was in on both plays, getting a full sack on the first one and then teaming with safety REGGIE NELSON on the second. "We wanted to make a statement," says Gilberry. "And one way to do it is to come out here against a division rival and play your heart out. That's what we did. We're trying to create our identity and that's what we're doing." Among the players to watch in this week's game will be wide receivers A.J. GREEN of Cincinnati and JULIO JONES of Atlanta. Both were selected in the first round of the 2011 NFL Draft and were the first two receivers taken (Green, No. 4 and Jones, No. 6). Last week, Green had six catches for 131 yards and the game-winning 77-yard touchdown while Jones had seven catches for 116 yards. The 49ers will host their first regular-season game at Levi's Stadium on Sunday night. San Francisco is coming off a 28-17 win at Dallas on Kickoff Weekend in which the team got scores on both offense and defense. Last week, 49ers quarterback COLIN KAEPERNICK threw two touchdown passes and posted a 125.5 passer rating, improving his record as a starter to 14-0 when he has a 100+ rating (including the playoffs). Tight end VERNON DAVIS caught both touchdown passes and his 53 touchdown catches since 2009 (including the playoffs) are the second-most in the NFL (Detroit's CALVIN JOHNSON, 54). Defensively, cornerback CHRIS CULLIVER opened the scoring with a 35-yard fumble-return touchdown and the 49ers forced four turnovers (three interceptions, one fumble). "Everyone was ready to get to the season, ready to play and ready to start putting these wins together," says Kaepernick. San Francisco running back FRANK GORE, now in his 10th season, reached 10,000 career rushing yards (10,033) last week. He is one of only 10 players in NFL history to rush for at least 10,000 yards and play 10+ seasons for a team. Chicago is searching for its first win of 2014 after a 23-20 overtime loss at home to Buffalo. Last week, Bears quarterback JAY CULTER threw touchdown passes to tight end MARTELLUS BENNETT and wide receiver BRANDON MARSHALL. Running back MATT FORTÉ had 82 rushing yards and 87 receiving yards to become the first Bear with at least 80 rushing and 80 receiving yards in a season opener since Pro Football Hall of Famer WALTER PAYTON in 1983. "We have 15 games left," says Cutler. "We have a lot of football left. We're going to get in a rhythm. We'll move on. We have San Francisco -- a tough road game -- coming up." The Eagles trailed 17-0 at halftime before rallying for a 34-17 win over Jacksonville in Week 1. With that win, Philadelphia is the first team in NFL history to win a game by at least 17 points after being shut out at halftime and trailing by at least 17 points. Quarterback NICK FOLES threw two touchdown passes, running back DARREN SPROLES had a career-long 49-yard TD run and defensive tackle FLETCHER COX returned a fumble 17 yards for a score. "The big thing is that as a team, we stuck together," says Foles about the comeback win. "My teammates stuck with me and we never wavered. We just kept fighting and that's why I love these guys. They're going to keep fighting and we're going to keep believing in each other." The Colts almost erased a 24-point deficit on the road at Denver last week but fell short, losing 31-24 to the Broncos. Quarterback ANDREW LUCK threw 252 of his 370 passing yards in the second half, including two touchdowns. In the fourth quarter, Luck connected with tight end DWAYNE ALLEN on a 41-yard TD and teammed with wide receiver HAKEEM NICKS on a nine-yard scoring strike to bring Indianapolis within striking distance. "When you start the way we started, you dig yourself a hole you can't come back from," says Colts head coach CHUCK PAGANO. How Many Turnovers Are Too Many for a Young QB? Will Peyton Manning Solve the Cardinals Secondary? Are the Cowboys the Best Team in the NFC East? Will New NFL Conduct Policy Exact Real Change? Did Roger Goodell's Press Conference Do Enough? Is Derek Carr the Answer in Oakland?